If you’re planning to propose, you may know that the special someone in your life would like a romantic public gesture – a declaration of love for a very special moment. There have been some very grand ones, such as a man who had the proposal put on a banner on the Queen Mary 2 ship as it came into harbour on Valentine’s Day. Others have done similar big ‘public’ exhibitions such as in crowded stadiums, pop gigs, big sports events and the like. A less dramatic but no less romantic gesture is hiring a live musician for your proposal (arguably it’s even more romantic!). Music can evoke many feelings and can make a special moment even more memorable. Think of the music you listened to as a teenager and how much it means to you as an adult. If you have an association with a particular song, it becomes really special. A friend of mine proposed on holiday in a beautiful hotel bar. There was a pianist playing and singing and when he got to ‘Never Tear us Apart’ by INXS, my friend took out the ring and got down on one knee. This song was already meaningful to them as a couple – now more so. It really is a magical moment and music makes it more so. You should plan the proposal quite thoroughly, such that the timings do not to go awry. For example, make sure you’re not so casual about arrangements that he/she doesn’t turn up! We were recently booked for a proposal in a spa at a London hotel. We (the string quartet) were all set and ready to play when our client’s fiancé-to-be was going to come out of the spa session he’d arranged for her. However, he left it until the last minute to tell her and she was tired so decided to go home instead! Needless to say we rearranged for another day and everything went perfectly. But arranging somewhat in advance is helpful. A question that we get asked a lot regarding wedding proposal acts is about how much time is needed. Some clients ask how much it is to hire the band or solo musician to play just one song. We point out that there’s not much difference between hiring a musician for one song or one hour – the majority of the time is spent travelling to and from the engagement and they have to block out the date anyway. The question of which is better is a different one and unrelated to cost. 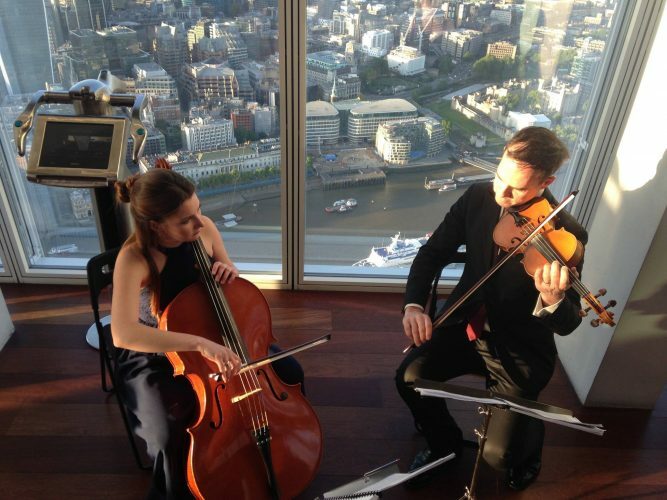 We’d say that if you’ve hired out a private area, say a dining room in a restaurant, then hire the musicians for an hour, do the proposal earlier and then enjoy the moment with beautiful background music. But if you’re in a public place, be aware that it can end up that if the musicians carry on playing/performing, it can become more like a free concert for complete strangers! Also, with the music just being for the five or ten minute proposal, it can be more special and unique just to keep it in that timeframe. Think quality of the moment over quantity of time – and the enhancement that brings to a marriage proposal. When it comes to what music, think about what your partner likes. If you don’t have a special song, you’re bound to know one that they love. It doesn’t have to be wildly romantic as a song and remember that romance is subjective. Some people hold back tears when songs like ‘Kissing You’ by Des’ree comes on the radio – others are turning the volume down as quickly as they can! A song may have particular romantic meaning to you as a couple and that’s fine also. Think above all about what your partner likes, not just what you like the idea of. We’ve done many proposals in and around London (venues and landmarks such as The Shard, London Eye, Natural History Museum, Andaz Hotel, Primrose Hill and Belmond Le Manoir aux Quat’Saisons to name a few). We’ve provided gospel singers, string quartets, singer guitarists and harpists amongst others, so there are many acts to choose from. Contact us today to discuss your proposal and how we can help you in creating a magical and unforgettable moment.